Going through a divorce can be an expensive process. There are many costs that are incurred in the course of the divorce, including the potentially high legal fees in complicated cases. The legal costs might convince spouses who are not in a high conflict relationship to try finalizing the divorce using a shared attorney. While this may seem like a good way to save some money, it is not a good idea and should be avoided. If a couple does not have much in terms of marital property and debt, and there are no children involved, the couple can decide to file for divorce without using an attorney at all. This can be a less expensive process; however, the court staff is not allowed to answer any substantive questions regarding the divorce. Therefore, even in these cases it would make sense to speak to an attorney. In Pennsylvania, attorneys are required to follow the rules of professional conduct, and are not allowed to represent a person if that representation will create a conflict of interest with a current client. One way a conflict of interest can be created is if an attorney’s representation of a client limits that attorney’s ability to represent another client. In the context of a divorce, an attorney representing both spouses in the divorce would likely create a conflict of interest because the attorney would need to provide advice regarding the division of marital property and child related issues. If one spouse can get more property when the court makes an equitable division of the marital property, the attorney would not be able to advise that spouse of that possibility without limiting his representation to the other spouse. Even if the couple can agree in general terms how to share their property and debts, and work out a parenting plan, the spouses should each seek the advice of an experienced attorney before agreeing to anything and filing with the court for finalization. It is not enough for one of the spouses to hire an attorney and try to get advice on an agreement the couple has drafted together. Both spouses need independent advice geared towards their own specific interests in the divorce. Hiring an attorney for advice or to review agreements does not mean that the divorce has to become contentious. Picking the right attorney and sharing their goals to keep the divorce low conflict can help spouses get the legal assistance they require without sacrificing a cordial relationship with each other. There are other ways that a couple can handle their divorce, including alternative dispute resolution methods such as mediation. 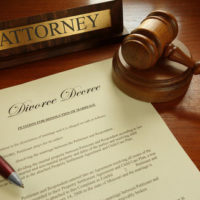 If you are considering filing for divorce or have received notice that your spouse has filed for divorce, you should speak with an experienced attorney as soon as possible to learn about your rights. For more information on the equitable division of marital property and child related issues, contact an experienced divorce attorney at the Media, Pennsylvania law firm Barbara Flum Stein & Associates serving Delaware County in all family law matters.